Monday 9:30am-5:30pm , Tuesday 9:30am-5:30pm , Wednesday 9:30am-5:30pm , Thursday 9:30am-9:00pm , Friday 9:30am-9:00pm , Saturday 9:00am-5:00pm , Sunday 10:00am-5:00pm . Promenades Drummondville offer more than 91 brand name stores. Promenades Drummondville is located in Drummondville, Quebec - 755, René-Lévesque Boulevard, Drummondville, QC J2C 6Y7 (GPS: 45.898162, -72.517576). 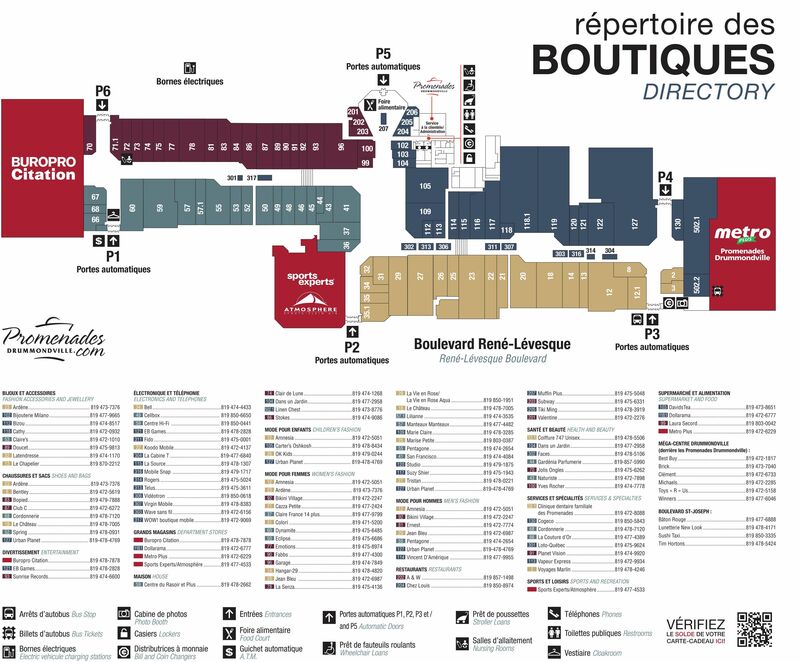 Look at the list of stores in Promenades Drummondville, hours, location and information about mall and special events, sales, coupons. You can choose store from list below and get detail information - other stores locations for the brand, location, shopping hours, phone, map, directions contact. Promenades Drummondville is one of the best shopping place for spend your free time - mall/shopping center has all types of stores - outlets, department, fashion, traditional and more. Have you ever visited Promenades Drummondville? Do not forget to write shopping review and rate your satisfaction. Les Promenades Drummondville is the premier shopping destination in the region. It was built as a single level shopping centre amd provides mone to 110 stores and services. The major retailers are Sears, Metro, Sports Experts/Atmosphere and Renaud-Bray. The easiest access to Promenades Drummondville is from Autoroute 20 (Autoroute 55). Take Exit 177, then continue onto Boulevard Saint-Joseph in direction to the center of the city. Promenades Drummondville is located on your left side after few moments, on the corner of Boulevard Saint-Joseph and Boulevard René Lévesque. Give us your experience with Promenades Drummondville by writing a short review.